Agbodeka, Francis (1971). African Politics and British Policy in the Gold Coast, 1868–1900: A Study in the Forms and Force of Protest. Evanston, IL: Northwestern University Press. ISBN 0-8101-0368-0. McCarthy, Mary (1983). Social Change and the Growth of British Power in the Gold Coast: The Fante States, 1807–1874. Lanham, MD: University Press of America. ISBN 0-8191-3148-2. Wilks, Ivor (1975). Asante in the Nineteenth Century: The Structure and Evolution of a Political Order. London: Cambridge University Press. ISBN 0-521-20463-1. Jim Jones. 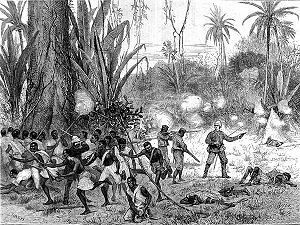 The British in West Africa. 2004 [2009-11-07]. （原始内容存档于7 November 2009）.